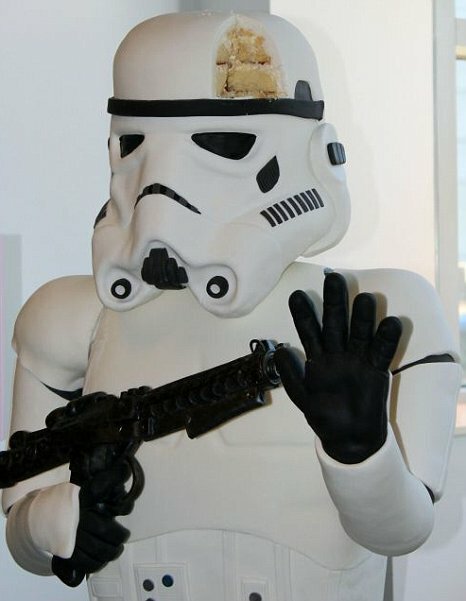 Star Wars fans spent two weeks baking a life-size Stormtrooper cake before dishing it out at a sci-fi convention in the US this week. This edible stormtrooper soldier was created by Star Wars fans Tiler and Amanda Oakleaf from Boston who enlisted other fans to help. It was made with 208 eggs, 64kgs of sugar and 25kgs of marshmallows stands at almost 2m tall and weighs 136kg. The body was supported by an iron frame and filled with layers of sponge and the legs were packed with Rice Krispies. It was then covered in icing before being fed to more than 600 sci-fi fans at the Arisia Sci-Fi Convention in Boston, Massachusetts. ‘It took two weeks to make the cake with the whole team involved, but we wanted to make sure that there were people to eat it in the end because we didn’t want to waste food,’ said Tiler. Earlier this month, in other weird new, a photographer re-magined Stormtroopers as loving fathers.